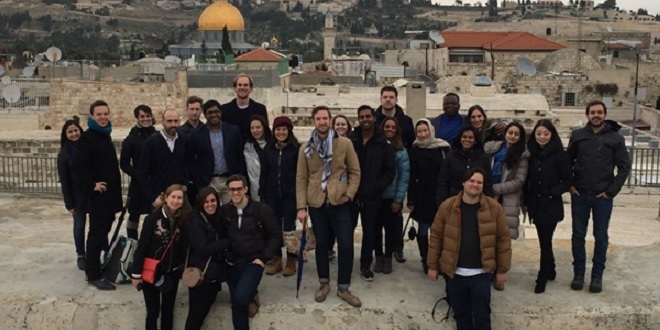 Over the winter break, 40 Cambridge MBA students travelled to Israel for a week to gain a better understanding of the country and its thriving technology sector. I had no idea what to expect, as this was my first business school trek. What we experienced was a trip of unparalleled breadth and depth, allowing us the opportunity to learn about the complexities of Israeli society and business first hand. Our introduction to Israeli politics was immediate: on the morning of our arrival, we had the privilege of attending a Q&A session for MBA students held by the Mayor of Jerusalem, Nir Barkat. Before becoming Mayor, Barkat had extensive private sector experience which has strongly influenced his policy agenda. Barkat emphasised the importantance of pragmatism and business-friendly reforms, while also delving into the difficulties of governing a divided city. Tel Aviv was the next stop on our Trek. The city is dotted with skyscrapers, chic cafes, and pedestrian promenades: it was like a Levantine Singapore. Tel Aviv is the heart of Start-Up Nation, the moniker that the country has adopted to represent the importance of the some 5000 young companies operating in Israel. To provide us with a more holistic understanding of this business ecosystem, our hosts arranged a panel of experts – partners in VC firms, billion dollar start-up founders, and C-level executives – to speak to us about the benefits and the downsides of doing business in Israel. Uniformly, all mentioned the importance of military experience in providing the country with a uniquely trained workforce. As well, they emphasised the fact that, due to the country’s limited population, companies are forced to create products with global viability because the domestic market alone is not large enough to sustain companies with ambitious growth plans. Being able to hear from some of Israel’s most successful businessmen was unequivocally one of the highlights of the trip, and provided us with insight that will be useful not only for those of us looking to conduct business in Israel, but also in any start-up environment throughout the world. On our last evening, we said our goodbyes before most headed off the next day. Although most of us were on friendly terms before the trek began, we ended the trip with even stronger bonds of friendship as the result of our time in a place so very different from our homes in Cambridge. Bleary-eyed as we ate our breakfasts the next morning, we heard the news of a terrorist attack in Jerusalem. This tragedy personalised the security struggles faced by Israel that we had heard about all week, driving home both the difficulty of living in a country surrounded by instability and why this precarious position has created a proud military and thriving business environment. What are the students in the Women’s Leadership Initiative (WLI) up to this year?